Ray-Ban sunglasses are unmistakable and their popularity is nearly unmatched. Whether you are looking to make a statement or just to own some of the best possible sunglasses available today, Ray-Ban is the brand for you. Materials and craftsmanship meet cutting edge style and popular trends to create a seamless blend of function and style. These are the sunglasses for you, NEVER HIDE in these awesome Ray-Ban sunglasses. This stylish Ray-Ban RB4105 Folding Wayfarer Sunglasses share the same design lines as the most popular Ray-Ban frame, the Original Wayfarer. This style is available in a variety of colors to help you personalize your Ray-Ban Folding Wayfarer. Unique design allows the temple pieces to fold, adding to practicality and portability. 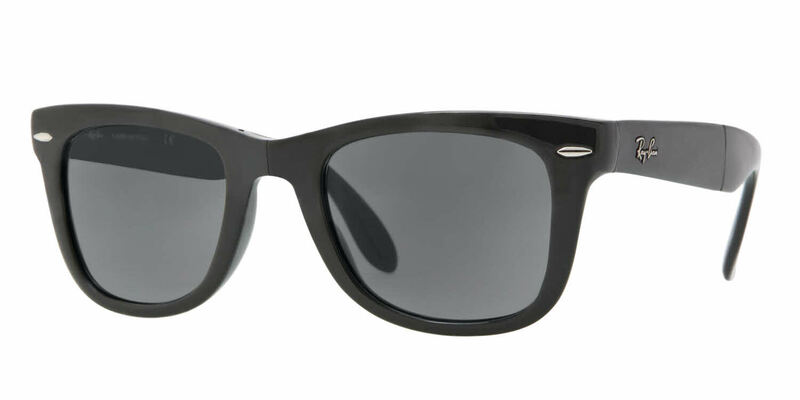 The Ray-Ban RB4105 Original Wayfarer Sunglasses are a stylish Wayfarer shape, a bold and original frame. Acetate plastic frame for lightweight comfort. We're going on a long trip this spring. I wanted something stylish, effective and compact. These folding prescription RayBans are just perfect. Works as described and is a sturdy well made product. Mine are prescription and it all comes together for a quality product and stylish fit. I needed a good pair of sunglasses and these did the trick. They are comfortable and look really. I've gotten many compliments about how they look. Frames Direct did an excellent job with shipping and updates about the product. Will order from Frames Direct again. I lost my beloved pair of Ray Ban folding Wayfarer prescription sunglasses that I have had for the past five years. They are sturdy glasses that neatly fold up in my purse. After reviewing the website and finding the glasses I still had questions on color and lenses. I contacted frames direct on two different occasions and spoke with two different opticians. They were both very friendly and knowledgeable. They quickly answered my questions and I was ready to order. I had to have them sent to a friend because I was going to be away. The frames arrived a bit sooner than expected and were correctly delivery to my friend. I picked them up yesterday and I was extremely impressed with the quality of the glasses and the prescription was even better than my last pair. I am so excited to have yet another pair of these fabulous glasses. Thank you Frames Direct! These folding sunglasses are very comfortable despite the hinges. You don't feel them at all. If anything, the folding aspect makes me feel better about just tossing them on the passenger seat in my car without worrying about them. Very nice quality and great fit.